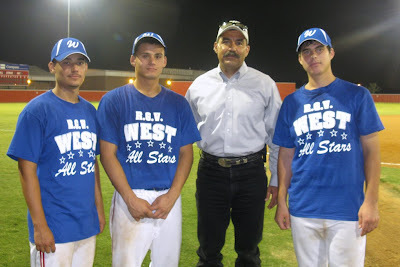 On Friday June 26, 2009 fans from Rio Grande City and Roma drove to Sharyland to show support for three baseball players from Starr County who were selected to play in the West Valley All Star Team. The players are Albert Salinas (Catcher) and Fernando Garza (Pitcher) representing Roma High School Gladiators and Vicente Rodriguez, III (Second Base) representing the Rio Grande City High School Rattlers. The players gave it their all and assisted their team in the 11 to 1 win over the East All Star Valley Team. Among the fans was Starr County Sheriff Rene Fuentes who is an avid baseball fan. Pictured: Vicente Rodriguez, III, Fernando Garza, Sheriff Rene Fuentes and Albert Salinas.